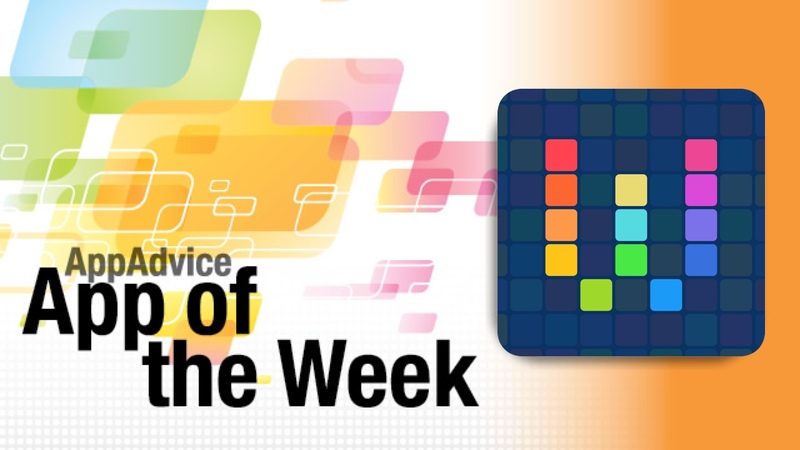 Make your life easier by automating tasks on iOS with our App of the Week. Have you ever wished for something like OS X’s Automator on your iOS device? Now you’re in luck, thanks to our App of the Week, Workflow from DeskConnect. In Workflow, automating the native iOS apps and features has never been easier. The app also has a bright and colorful design that is simple to navigate through, thanks to similarities to the home screen and App Store. All of the workflow icons can be customized with your choice of color and icon, and everything can be renamed to make it easier for you to remember. The drag-and-drop method used for creating workflows is also intuitive, so even the average user can come up with some great automated processes with the app. There are several ways to get workflows in Workflow. Users can create their own from scratch, which is recommended if you want to create something that perfectly suits your needs. The tutorial in the beginning will help you understand the basic steps of doing so. The other ways of getting workflows is through the Gallery, which is laid out in a similar fashion to the iPhone App Store. There are a few featured sections that the app will cycle through at the top, and more individual workflows underneath. Users can tap on a workflow to preview it before adding it to their own collection. Now that Workflow has been out for a few days, there are plenty of users who are sharing their workflow creations. 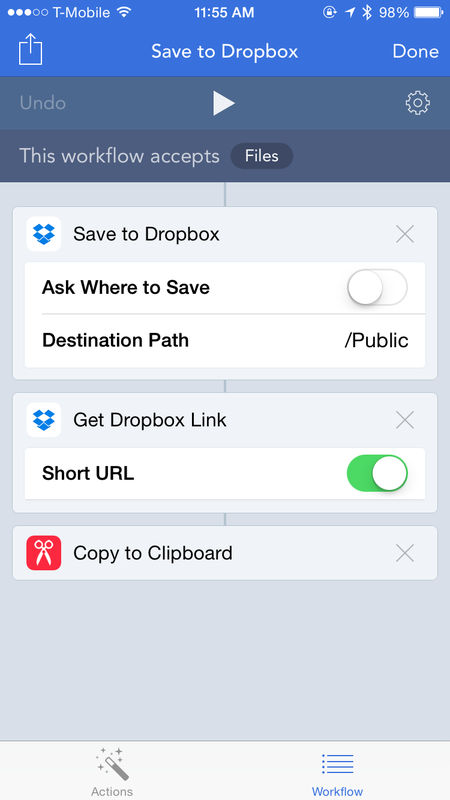 If you stumble on anything interesting, you can get a link that will install the workflow in your app in seconds. Now, you may be confused by what a “workflow” really is. In short, it is a chain of iOS actions that you can put together to automate a process to make your life easier. You can always tweak a workflow in your collection by rearranging action order, adding new steps, or taking stuff out that you don’t need. There are over 150 actions spread out across 10 categories in Workflow, and users can also select the input that is accepted in a workflow, such as contacts, dates, images, URLs, text, and many more. Workflows can be initiated within Workflow by tapping on the Play button, or users can get quick access to them by creating home screen or Launch Center Pro shortcuts. 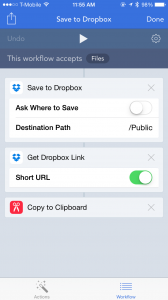 They can also be an Action Extension type of workflow, which means you can access them from the native iOS Share Sheet in most apps. We always love tinkering around with automation on our iOS devices, so we’ve been tinkering around with Workflow the past week with some fantastic results. If you are in the mood for an app that will make your iOS life easier, then you need to give Workflow a look if you haven’t already. You can find it on the App Store for $2.99 for a limited time (40 percent off $4.99). For more about Workflow, don’t miss out on my complete review. Browse, get inspired, and submit your own art with our Honorable Mention of the week! Familiar with DeviantArt, the popular online art community that was originally launched in 2000? It’s still around, and now it’s never been easier to access it from iOS, thanks to the new official app. The app has a beautiful interface that is definitely eye-catching, but even more so thanks to how it showcases the talent that can be found on the community. DeviantArt can be used by members and non-members. It’s easy to navigate and will keep you entertained for hours to come. The biggest feature of DeviantArt is the stream of artwork from members. This stream is endless, as it loads up more images as you scroll to the bottom. You can even tap-and-hold on images to bring up controls for adding it to your favorites, sharing, or browsing more art that is related to the one you were viewing. If you’re a member of the community, there is also a nifty submit feature, so you can upload your art on-the-go. You can also get notifications, post comments, collect art for inspiration, and write journals to go with your work. We may not be artists here at AppAdvice (at least most of us), but we still enjoy browsing the creative works of others. 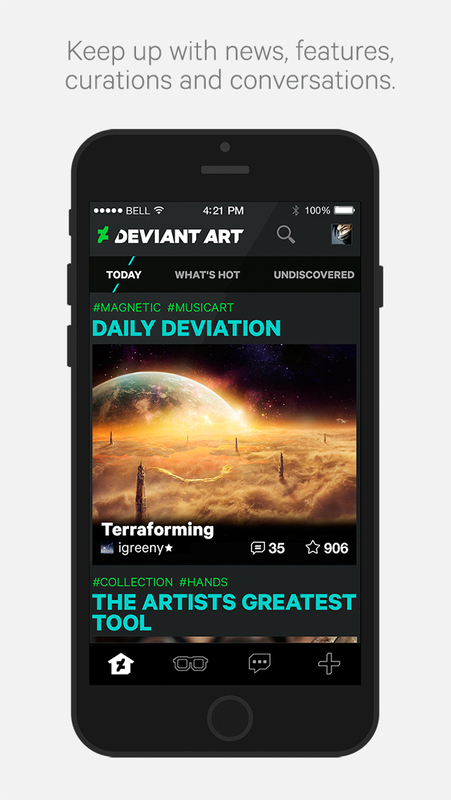 DeviantArt has been around for a long time, so we are glad to see it finally arrive on iOS. 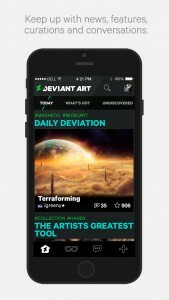 You can get the DeviantArt app for free on the iPhone. For more about DeviantArt, check out our original article.